Adventures of Superman is an American television series based on comic book characters and concepts that Jerry Siegel and Joe Shuster created in 1938. The show was the first television series to feature Superman and began filming in 1951 in California on RKO-Pathé stages and the RKO Forty Acres back lot. Cereal manufacturer Kellogg's sponsored the show. The show, which was produced for first-run television syndication rather than a network, has disputed first and last air dates, but they are generally accepted as September 19, 1952, and April 28, 1958. The show's first two seasons (episodes 1–52, 26 titles per season) were filmed in black and white; seasons three through six (episodes 53–104, 13 titles per season) were filmed in color but originally telecast in black and white. Adventures of Superman was not shown in color until 1965, when the series was syndicated to local stations. George Reeves played Clark Kent/Superman, with Jack Larson as Jimmy Olsen, John Hamilton as Perry White, and Robert Shayne as Inspector Henderson. Phyllis Coates played Lois Lane in the first season, with Noel Neill stepping into the role in the second (1953) and later seasons. Superman battles crooks, gangsters, and other villains in the fictional city of Metropolis while masquerading "off duty" as Daily Planet reporter Clark Kent. Lois Lane and Jimmy Olsen, Clark's colleagues at the office, often find themselves in dangerous situations that only Superman's timely intervention can resolve. Its opening theme is known as The Superman March. In 1987, selected episodes of the show were released on VHS. In 2006, the series became available in its entirety on DVD to coincide with the DVD release of Superman Returns, the first Superman feature film to emerge after almost two decades without such a movie. The feature film Hollywoodland was released in 2006, dramatizing the show's production and the death of its star George Reeves. In 1951, California exhibitor and B-movie producer Robert L. Lippert released a 58-minute black-and-white movie starring George Reeves and Phyllis Coates called Superman and the Mole Men with a script by Robert Maxwell (as Richard Fielding) and direction by Lee Sholem. The film served as a pilot for Adventures of Superman and prompted the first season to go into production in August/September of the same year. The series discontinued production, however, and remained unaired until September 1952, when cereal manufacturer Kellogg's agreed to sponsor the show, as the company had previously done with the Superman radio series. The success of the series came as a complete surprise to the cast. The initial feature film, Superman and the Mole Men, was subsequently edited into a two-part story called "The Unknown People" and was televised late in the first season. It was the only multi-part story of the series. After the first season's filming was completed, actress Phyllis Coates made other commitments and did not return as Lois Lane for the second season. Noel Neill, who had played the character in both Columbia theatrical serials stepped into the role and remained until the series' cancellation. The core cast thereafter remained intact, with Phillips Tead occasionally joining the regulars in the last seasons as the eccentric recurring character Professor Pepperwinkle. To promote and advertise the show, cast members Reeves, Hamilton, and Larson were able to gain extra money by appearing in Kellogg's commercials during the second season. However, Noel Neill was never approached for these because sponsors worried that scenes of Clark Kent having breakfast with Lois Lane would be too suggestive. From the beginning, the series was filmed like a movie serial with principals wearing the same costumes throughout the show to expedite out-of-sequence shooting schedules and save budgetary costs. For instance, all scenes that took place in the "Perry White Office" set would be filmed back to back for future placement in various episodes, which was often confusing to the actors. Money was further saved by using Clark's office as Lois's office with a simple change of wall hangings, thus dispensing with additional set construction. Other scenic shortcuts were employed. In the last seasons, for example, few exterior location shoots were conducted, with episodes being filmed almost entirely in the studio. Reeves's red, blue, and yellow Superman costume was originally brown, gray, and white so that it would come through photographically in appropriate gray tones on black-and-white film. After two seasons the producers began filming the show in color, a rarity for the time. Filming of the color episodes began in late 1954, and they were broadcast in monochrome starting in early 1955. Because of the added cost of filming in color, the producers cut the number of episodes per season in half. Each 26-week season would feature 13 new episodes and 13 reruns of the older black-and-white shows. The monochrome prints of the color episodes also had to be treated so that there would be a somewhat similar contrast in the colors of Reeves's new costume to that from the earlier seasons, with the contrast increasing each season, as the gray tones of the blue and red colors would otherwise have been rendered nearly indistinguishable. Throughout the last 50 episodes, a lackadaisical attitude toward flubbed lines prevailed, ascribed to morale deterioration among cast and crew with the added expense of color filming and salary disputes. Producer Whitney Ellsworth later admitted: "Sometimes there was just garbage in the rushes, but we were often forced to use what we had, rather than relight the set and go again." Phyllis Coates, like George Reeves, was a popular lead in B features of the period. For the TV series, Reeves asked that Coates receive equal star billing. Coates created a sharp, strong-willed Lois Lane, an enterprising reporter who tries to outscoop Clark Kent. Jack Larson's Jimmy Olsen is a Daily Planet intern, often investigating some wrongdoing. Usually the villains catch him. Superman usually helps him in the nick of time. In the film noir-like early episodes, Superman himself is seen as a semi-mysterious presence, unknown to many of the crooks. "Who's the guy in the circus suit?" asks a villain in "The Riddle of the Chinese Jade". Eventually, all the crooks knew exactly who he is, often with the bug-eyed exclamation "SOOPAH-man!" when he first appears. The first season's episodes usually featured action-packed, dark, gritty, and often violent story lines in which Superman fought gangsters and crime lords. Many characters met their deaths in these episodes. The deaths of some of them were actually shown. When it came time to reassemble the cast and crew for filming the second season, Phyllis Coates was no longer available, having committed herself to another project. The producers then hired Noel Neill and gave her secondary billing with Larson, Hamilton, and Shayne. Neill's portrayal was more accessible to the younger television audience, sweeter and more sympathetic than the efficient, hard-as-nails Coates characterization. Bob Maxwell, whose episodes in the first season verged on the macabre, left the show, going on to produce Lassie in 1954. Whitney Ellsworth, already working on Adventures of Superman as an uncredited associate producer and story editor during the initial season, became the show's executive producer in 1953 and would remain so for the duration of the series. The second-season shows were still fairly serious in nature, retaining the film-noir/crime drama qualities while steering more in a science fiction direction, with Ellsworth tempering the violence significantly. With most of the villains becoming comic bunglers less likely to frighten the show's juvenile viewers and only some occasional deaths, usually off screen, Kellogg's gave its full approval to Ellsworth's approach and the show remained a success. Sentimental or humorous stories were more evident than they had been during the first season. A large portion of the stories, however, dealt with Superman's personal issues, such as his memory loss in "Panic in the Sky". With the color seasons, the show began to take on the lighthearted, whimsical tone of the Superman comic books of the decade. The villains were often caricatured, Runyonesque gangsters played with a tongue-in-cheek style. Violence on the show was toned down further. The only gunfire that occurred was aimed at Superman, and, of course, the bullets bounced off him. Superman was less likely to engage in fisticuffs with the villains. On occasions when Superman did use physical force, he would take crooks out in a single karate-style chop or, if he happened to have two criminals in hand, by banging their heads together. More often than not, the villains were likely to knock themselves out fleeing Superman. At this point, Jimmy, who was very popular with viewers, was being played as the show's comic foil to Superman. Many of these plots had Jimmy and Lois being captured, only to have Superman rescue them at the last minute. Scripts for the sixth and final season reestablished a bit of the seriousness of the show, often utilizing science fiction features like a kryptonite-powered robot, atomic explosions, and impregnable metal cubes. In one of the last episodes, "The Perils of Superman" (a takeoff on The Perils of Pauline), there was indeed deadly peril straight out of the movie serials: Lois was tied to a set of railroad tracks with a speeding train bearing down on her, Perry White was nearly sawn in half while tied to a log, Jimmy was in a runaway car headed for a cliff, and Clark Kent was immersed in a vat of acid. This was one of three episodes George Reeves directed himself. Noel Neill's hair was dyed a bright red for this season, though the color change was not apparent in the initial black-and-white broadcasts. ABC-TV aired episodes in its "Fun At Five" series during the 1957-58 season. Reeves appeared as Superman on an episode of I Love Lucy that aired on January 14, 1957. In the episode, his character is only called "Superman." No mention of George Reeves is ever made until the credits roll. The announcement "Our guest star tonight was George Reeves, star of the Superman series" was deleted from the episode after its first network broadcast. The episode was later colorized and re-broadcast as part of an hour-long Lucy special on the CBS network on May 17, 2015. At the request of the US Treasury Department, the production company made a special truncated film, with a run time of 17m and 32s, to promote school savings-stamp plans to children. 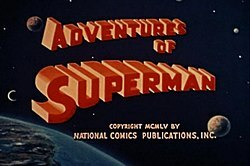 Shown in grade schools during the 1950s, the decade of Adventures of Superman, this is the only "episode" of the series that has entered the public domain. It features Clark Kent/Superman, Jimmy Olsen and Lois Lane and plays like a normal black-and-white episode of the second season, with series semi-regulars Tristram Coffin, as a government spokesman, and Billy Nelson, as a criminal. Thomas Carr directed this film. This film was released on the Season Two DVD box set of The Adventures of Superman. A link below gives a free download of this film. Adventures of Superman began filming at the RKO-Pathe Studios (later Desilu Studios) in Culver City, California, in August–September 1951. Episodes cost roughly $15,000 apiece. As previously mentioned, this made the show a low-budget program by the standards of its day. In 1953–54, the show was filmed at California Studios and, in 1955, at Chaplin Studios. In 1956–57, the show was filmed at Ziv Studios. The establishing shot of The Daily Planet building in the first season was the E. Clem Wilson Building in Los Angeles, California, on Wilshire Boulevard, for decades famous as the headquarters of Mutual of Omaha, its brilliant white globe atop a tall pillar a familiar landmark to local residents, while the Carnation Milk Company Building a few blocks east on Wilshire served as The Daily Planet's front door. From the second season onward, stock shots of the 32-story Los Angeles City Hall were used as the Planet building and the sidewalk entrance to the Planet was a studio-bound "exterior." Many exteriors in the first season were shot at the RKO Pictures backlot, called "Forty Acres", a facility later used for the fictional, idealized small town of Mayberry, North Carolina, on The Andy Griffith Show. Hillsides in Culver City, city streets of downtown Los Angeles, or residential areas of the San Fernando Valley were sometimes used as exteriors during all six seasons. In later seasons, filming occurred on sound stages, with exterior shots, such as cars driving along roadways, shot as second-unit material, often with doubles at the wheel. Establishing shots of Queen of Angels Hospital in the Echo Park section of Los Angeles were often used in episodes (such as "The Face and the Voice") during the second season, although the hospital was identified as "Mercy General". Another Los Angeles stock-footage landmark was the Griffith Observatory, which had several different "cameos" in the series, first serving as Jor-El's home/laboratory. Aside from a few clips of New York City in "Superman on Earth", most, if not all, of the stock clips used to depict Metropolis are of the Los Angeles area. The First National Bank served as one of the Metropolis backdrops. The show's title card (see infobox above right) imitated the three-dimensional lettering of the comic book covers. Occasional confusion arises about the article "the," since it was spoken by narrators in voice-overs. Some references title the show "The Adventures of Superman"; other books, as well as TV Guide listings, simply label the show "Superman". The onscreen title of the show is Adventures of Superman, with no article preceding "Adventures." Kellogg, 'The Greatest Name In Cereals', presents the Adventures of Superman! Faster than a speeding bullet! More powerful than a locomotive! Able to leap tall buildings at a single bound! Yes, it's Superman ... strange visitor from another planet, who came to Earth with powers and abilities far beyond those of mortal men! Superman ... who can change the course of mighty rivers, bend steel in his bare hands, and who, disguised as Clark Kent, mild-mannered reporter for a great metropolitan newspaper, fights a never-ending battle for truth, justice, and the American way! And now, another exciting episode in the Adventures of Superman! From the second season onward, the final sentence ("another exciting episode") was dropped. In later syndication, when Kellogg's was no longer the sponsor, the episode openings were re-edited to remove the opening line relating to the cereal company. The score for the series was taken from stock music libraries, often adaptations of music from B-movies. For example, one cue used in the episode "Peril by Sea" also appears in Plan 9 from Outer Space. Apparently the only original music written for the series was the March heard primarily during the credits. The theme is ascribed to studio music arranger Leon Klatzkin, although it may have been adapted from an earlier unrelated, and now lost, theme. The main theme, based on a triad, matched the three syllables in the character's name, as has been the case with nearly all Superman music. With the exception of the title theme, musical cues ranged from the serious to the lighthearted and were different for each of the seasons, except for the third season, where some cues from the previous season would be reused in a number of episodes. Each season's cues tended to be used repeatedly from episode to episode, in similarly appropriate "mood" moments such as apprehension, humor or fast action. The opening credits theme, Superman's "leitmotif", was often (though not always) used whenever Superman was depicted flying or taking action. The show's sponsor was Kellogg's, maker of corn flakes and other breakfast cereals. The characters from the TV series, except Lois Lane and Superman himself, made a number of TV commercials promoting their cereal products. These commercials were usually shown as "integrated commercials" at the end of the program. Some of these commercials are preserved in the DVD series as special features. Some versions of the show contained a vocal introduction, "Kellogg's, 'The Greatest Name In Cereals', presents ... The Adventures of Superman." The sponsor originally requested to have this line placed, at the intro's start, on every single episode of the series, as well as—from second season onward—the company's logo on the intro and on the end of the closing credits. When Kellogg's ceased being the show's sponsor, the logo and the intro line were removed from some prints, especially when Warner Bros. Television received distribution rights. While considered simple by today's standards, the "flying" effects on Adventures of Superman were advanced for the period, although during season one it was apparent that, for distance flight shots, Superman was lying on a flat surface, his torso and thighs noticeably flattened between elbows and knees. Beginning with season two, Superman's "flying" involved three phases: take-off, flight, and landing. Cables and wires were used for Superman's take-offs early in filming. In early episodes, stuntmen sometimes replaced Reeves for Superman's wire-assisted take-offs. When Reeves came close to suffering a concussion in the episode "Ghost Wolf"—the supporting wires snapped, and he fell to the studio floor—cables and wires were discarded and a springboard was brought in, designed by Thol "Si" Simonson, who remained with the series until its end. Reeves would run into frame and hit the out-of-frame springboard, which would boost him out of frame, sometimes over the camera, and onto padding. The springboard had enough force, along with subtle camera manipulation, to make it look as though he was actually taking off. A relatively few number of repeated shots became the flying scenes. The typical technique had footage of Reeves stretched out on a spatula-like device formed to his torso and leg, operated on a counterweight like a boom microphone, allowing him to bank as if in flight. In a couple of later episodes, such as "The Atomic Secret", Reeves simulated flying, opting to lie on the device without the molded form to support his legs, which are seen to hang from the waist in those episodes in marked contrast to the stock footage of Superman in flight. In the two monochrome seasons, Reeves was occasionally filmed in front of aerial footage on a back-projection screen or against a neutral background which would provide a matte which would be optically combined with a swish-pan or aerial shot. That footage was matted onto various backgrounds depending on the needs of the episode: clouds, buildings, the ocean, mountain forests, etc., by which he would appear to fly. For the color episodes, the simpler and cheaper technique of a neutral cyclorama backing was used, usually sky-blue, or black for night shots. Techniques for landings involved Reeves jumping off a ladder or holding an off-camera horizontal bar and swinging down into frame. George Reeves, John Hamilton, and Robert Shayne. Superman, a being from the planet Krypton, is rocketed to Earth in his infancy. He grows to manhood under the adoptive parental care of Eben and Sarah Kent. As an adult, he moves from Smallville to Metropolis after his father, Eben, dies. In Metropolis, he becomes a Daily Planet reporter under his human name of Clark Kent. Despite the show's introduction describing Kent as "mild-mannered" and colleagues constantly calling him "timid" and even "spineless", Clark Kent is mildly assertive and authoritative during situations when he is not Superman. He frequently takes charge in emergencies and is not afraid to take reasonable risks. He puts his superpowers to work battling crime in Metropolis and is often called upon to rescue his associates Jimmy Olsen and Lois Lane. The Superman of the television series developed superpowers beyond his precursors in radio, cartoons, comics, and theatrical serials. On occasion, he separated his molecules to walk through walls, isolating a particular voice over multiple telephone lines long distance while flying, became invisible, and split in two while retaining his traditional powers of X-ray vision, microscopic vision, super-speed, super-hearing, super-breath, super-strength, flying, and a mastery of foreign languages. Both Superman's Kryptonian parents, Jor-El and Lara, and his adoptive Earth parents, the Kents, appear only in the premiere episode, "Superman on Earth". George Reeves plays Superman/Clark Kent. Lois Lane is a reporter with the Daily Planet and Clark Kent's associate. She is a well-dressed, competent professional woman. She suspects Kent is Superman and awaits an opportunity to confirm her suspicions. In the Noel Neill episodes, Lois is infatuated with the Man of Steel and dreams of being united in marriage with him. Lois returns to her hometown in the season-one episode "The Deserted Village." Phyllis Coates plays Lois in the first season. For the remainder of the show's run after the first season, Noel Neill plays her. She is stated as being 26 years old in the 1957 episode "The Tomb of Zaharan". Jimmy Olsen is a cub reporter and photographer with the Daily Planet and an associate of Kent and Lane. Jimmy's mother makes an appearance in an early episode. Though boyish in his tastes and sense of humor, Jimmy occasionally displays mature astuteness, courage, and judgment. Jack Larson plays Jimmy. Perry White is the blustering, impatient editor and publisher of the Daily Planet. He is sometimes a participant in the dangerous exploits of Lois and Jimmy as they pursue news stories. He treats crooks and thugs with disdain and lofty contempt—in one episode, he mentions that he was once a crime reporter. Perry's sister Kate appears in the first-season episode "Drums of Death"; he has a nephew, Chris, who appears in the second-season episode "Jet Ace." John Hamilton plays Perry White. Inspector Henderson of the Metropolis Police is a friend of the Daily Planet staff and often works in conjunction with them on crime investigations. Henderson has a teenage son named Ray who appears in one episode. Henderson was the creation of the radio series writers. Robert Shayne plays Inspector Henderson. Phillips Tead as Professor Pepperwinkle. Professor Pepperwinkle is an elderly, absent-minded inventor whose gadgets cause Superman much trouble and concern in five episodes during the last three color seasons. Phillips Tead plays him. Professor Oscar Quinn is an eccentric inventor making two appearances in the second season. Sterling Holloway plays him. Holloway played a similar character, Professor Twiddle, in the third-season episode "Through the Time Barrier". Miss Bacharach is a nervous, easily excited, and easily fooled receptionist at the Daily Planet who appears in three first-season episodes and is mentioned in two others. Dani Nolan, Aline Towne, and Almira Sessions, listed here respectively, play her in her first, second, and third episodes. Professor Lucerne is an old friend of Superman's who advises him in matters scientific. Lucerne appeared in two consecutive episodes in the final season. Everett Glass plays him. Tris Coffin; Herb Vigran; John Eldredge, best known as Harry Archer on Meet Corliss Archer (1954); Philip Van Zandt; and Ben Welden made multiple appearances over the course of the show, always as different villains. Claude Akins as Ace Miller, criminal in "Peril by Sea." Akins previously appeared with George Reeves two years earlier in the movie From Here To Eternity, and would later play Sheriff Lobo on the 1970s television series B. J. and the Bear and The Misadventures of Sheriff Lobo. Mabel Albertson as Kate White, Perry White's sister, in "Drums of Death." John Banner played a butler to a wealthy individual. Banner later became famous as Sgt. Schultz on Hogan's Heroes. Hugh Beaumont as Dan Grayson, an ex-convict wanting to reform his life, in "The Big Squeeze". Beaumont is best known for his portrayal of Ward Cleaver on the series Leave It to Beaver, from 1957 to 1963. John Beradino as Dexter Brown, in "The Unlucky Number". Beradino would later become better known to soap opera fans as Dr. Steve Hardy on the long running soap General Hospital. James Brown as Jim Carson in "Around the World with Superman" (1954). Paul Burke as Ace, a criminal, in "My Friend Superman"; Matthew Tips in "Superman Week"; and Rosy in "The Phantom Ring." Burke later starred in the 1960s series Naked City and Twelve O'Clock High. Jimmy Dodd as Jake in "Double Trouble." Chuck Connors as Sylvester Superman in "Flight to the North"; his later The Rifleman supporting player Paul Fix had appeared in "Czar of the Underworld" and "Semi-Private Eye." 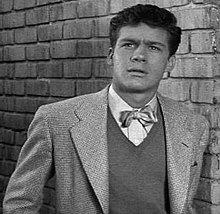 Billy Gray as Alan, a teenager who snaps a photo of Superman that may reveal the superhero's earthly identity in "Shot in the Dark". Gray would become known as "Bud" Anderson, Jr. in the situation comedy Father Knows Best. Dabbs Greer, in "Superman on Earth", the premiere episode, as a man falling from a dirigible; as a man falsely convicted of murder in "Five Minutes to Doom"; and in the dual roles of Mr. Pebble/Dan Dobey in "The Superman Silver Mine." Greer would become well known years later as Reverend Alden on the television series Little House on the Prairie. Ed Hinton as Cave Man in "Through the Time Barrier" and as Joe in "The Phantom Ring". Joi Lansing as Sergeant Helen J. O'Hara, a policewoman posing as the titular character in the episode "Superman's Wife". Tyler MacDuff as Frankie in "The Boy Who Hated Superman". Eve McVeagh as Mrs Wilson in "The Stolen Elephant". Vic Perrin as a sailor called "Scurvy" in "The Golden Vulture." 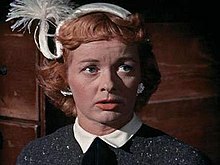 Ann Tyrrell as Miss Walton in the first-season episode "The Deserted Village." Other veteran film and television actors making appearances on the show included George E. Stone, James Craven, Dan Seymour, Victor Sen Yung, Maudie Prickett, John Doucette, Norma Varden, Roy Barcroft, Elizabeth Patterson, and George Chandler. Director Tommy Carr's brother Steve appeared as an unbilled extra in nearly every one of the first 26 shows and frequently in more substantial character roles. He was also the show's dialogue director and was the man pointing "up in the sky" in the introductions of the black-and-white shows. 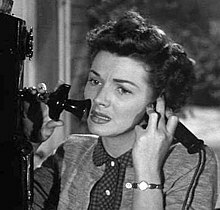 Phyllis Coates in the first-season episode, "Night of Terror". Episodes follow Superman as he battles gangsters, thugs, mad scientists and non-human dangers like asteroids, robots, and malfunctioning radioactive machines. In the first episode—the "origin" episode—Superman's infant life on the planet Krypton, his arrival on Earth, and a family couple nurturing and raising him are dramatized. In succeeding episodes, he conceals his super-identity by posing as mild-mannered Daily Planet reporter Clark Kent who, in times of crisis, dashes into the Daily Planet's storeroom, or an alley, sheds his street clothes, and reappears in superhero tights and trunks, all at super-speed, to rescue hapless folks from the clutches of evildoers. According to Gary Grossman's "Superman: Serial To Cereal" book, 5 movies were made in 1953 from 15 episodes: "Superman's Peril", "The Golden Vulture", "Semi-Private Eye", "Defeat Of Superman", "Superman Flies Again", "Jet Ace", "The Dog Who Knew Superman", "The Clown Who Cried", "Superman In Exile", "The Face And The Voice", "The Whistling Bird", "A Ghost For Scotland Yard", "The Lady In Black", "Panic In The Sky", "Superman And The Jungle Devil", "The Machine That Could Plot Crimes", and "Shot In The Dark". Superman arrived on television in 1952 with a mythology established through comic books, a novel, a radio series, two theatrical serials, and seventeen Max Fleischer animated shorts. None of Superman's established foes like Lex Luthor or super villains appeared in the TV series, and the most potent element incorporated into the show from the established mythology was the superhero's vulnerability to green kryptonite; the other colored versions (red, white, blue, gold, etc.) didn't appear. Several episodes during the course of the show's run featured the substance as a plot device. Another element appropriated from the mythology for the television series was Lois Lane's suspicions regarding Clark Kent's true identity and her romantic infatuation with Superman. Also, unlike the comic book version, Superman was never shown to be vulnerable to magic, as real magic (as opposed to stage or performance magic) was considered nonexistent in the series. In 1958, producer Whitney Ellsworth created Superpup, a never-aired-on-TV spin-off pilot that placed the Superman mythos in a fictional world that dogs populated. Featuring live-action actors in dog-suits portraying canine versions of Superman and other characters, the pilot was filmed on Adventures of Superman sets and was intended to capitalize on the success of its parent series. Producers planned to continue Adventures of Superman in 1959 with two more years' worth of episodes, to begin airing in the 1960 season. The death of actor John Hamilton threw the plan into disarray. Actor Pierre Watkin was hired to replace Hamilton as "Perry White's brother." Watkin had played Perry White himself in the two Columbia serials and had guested on the series before. The sudden death of the show's star George Reeves in June 1959 was not the end of the series either, in the producers' eyes. When Jack Larson returned from Europe after the death of Reeves, producers suggested the series could continue as "Superman's Pal, Jimmy Olsen," with more focus on Larson continuing his character, playing opposite a "Superman" who would be a composite of stock shots of George Reeves and a look-alike stunt double to be filmed from behind. Larson rejected the distasteful idea out of hand, and the series was truly over. Another spin-off idea was a pilot Whitney Ellsworth produced in 1961: The Adventures of Superboy. Johnny Rockwell starred as a young Clark Kent in Smallville, and as Superboy, he wore a suit similar in design to George Reeves' suit. Although thirteen scripts had been written, only the pilot was filmed. Neill and her original 1948 Superman serial co-star, Kirk Alyn, enjoyed cameos in the 1978 film Superman as Lois Lane's parents. Their dialogue scene was cut for theatrical release, but played in its entirety when the film was broadcast on TV, and later in the 2001 director's cut restoration. Neill and Jack Larson both made guest appearance on the TV series Superboy in the episode "Paranoia" during the show's fourth season. Larson was cast as a man-on-the-street in an American Express ad called The Adventures of Seinfeld and Superman, featuring Superman fan Jerry Seinfeld. Patrick Warburton voiced the animated Superman. Larson also had a guest appearance on Lois & Clark, playing an elder Jimmy Olsen. Like Neill, Larson participated in various conventions connected with Superman. He also donated his time to provide commentaries for some of the episodes on the DVD releases during 2005 and 2006 and the 2006 documentary history of the Superman character, Look, Up in the Sky. Robert Shayne received a recurring role as "Reggie," the blind newspaper vendor, in The Flash in 1990–91 because the producers were aware of his Superman connection. Shayne was, in fact, legally blind by that time. Phyllis Coates played the part of Lois Lane's mother in a 1993 episode of Lois & Clark: The New Adventures of Superman at the suggestion of Lois & Clark guest star (and George Reeves biographer) Jim Beaver. The Coates Orphanage in Metropolis, which appears in the Lois and Clark episode "Season's Greedings," is named for her. 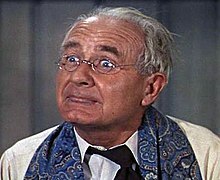 Both Noel Neill and Jack Larson had minor roles in the 2006 movie Superman Returns. Neill played the multimillionaire wife of Lex Luthor, played by Kevin Spacey, who dies at the beginning of the film, leaving her entire inheritance to Luthor. Larson played a bartender. Episode copyright dates are confusing. When the series went into syndicated reruns, Kellogg's ceased being the show's sponsor and its name had to be removed from the opening titles. During the first decade of reruns, when all episodes were still shown in black and white, each episode's opening had the Kellogg's reference noticeably, and often not very well, edited out, sometimes leaving portions of "the greatest name in cereals, presents" in the finished product. Nothing else being done to the openings, the different years' flying sequences and year of release remained intact. In 1987 and 1988, coinciding with the 50th anniversary celebrations of the Superman comic book character that year, Warner Home Video released selected episodes of the series to VHS and LaserDisc, under the TV's Best Adventures of Superman title, with four volumes released in total. Each volume contained one black-and-white episode and one color episode, plus a Max Fleischer Superman animated short. These videos were later re-released during the mid-1990s under new packaging artwork. Columbia House released 20 VHS volumes of the series under their Adventures of Superman: The Collector's Edition series, with each videotape containing three episodes, which was only available through mail order subscriptions during the 1990s. In 2003, Truth, Justice, & The American Way: The Life And Times Of Noel Neill, The Original Lois Lane was published, and, in 2007, the film Hollywoodland was released to DVD. Warner Home Video has released all 6 seasons of the Adventures of Superman on DVD in Region 1. Warner has also released Seasons 1–4 in Region 2 & 4. On April 8, 1953, Variety reviewed the April 1 New York premiere, writing, "It's to National Comics credit that its television version is restrained on the scripting side and well done technically ... Filming is top-notch, with no expense spared to get those special effects. George Reeves, who acts Superman, doesn't have too much of a role in the initial pix, since most of it deals with boyhood of the hero, but he registered nicely as the meek reporter and as the hero. Phyllis Coates was okay as Lois Lane, the girl reporter, while John Hamilton fits the fictitious concept of the editor. Other roles were well handled." The show received a proclamation in July 2001 on its 50th Anniversary from the Los Angeles County Board of Supervisors in a ceremony that Jack Larson; Noel Neill; Robert Rockwell, who played Jor-El in "Superman on Earth"; Jeff Corey, from the pilot Superman and the Mole Men; Mrs. Robert Shayne; and Mrs. Jerome Siegel attended. DC Comics Vice President Paul Levitz accepted the proclamation scroll. In 2006, the show's first season received a Saturn Award nomination from the Academy of Science Fiction, Fantasy and Horror Films for "Best Retro Television Release on DVD". In 2007, the show's complete six seasons received a Saturn Award for "Best Retro Television Series Release on DVD". ^ "Adventures of Superman". epguides.com. Archived from the original on September 21, 2015. Retrieved September 21, 2015. ^ "The Adventures of Superman". supermanhomepage.com. Retrieved October 29, 2013. ^ "Barely a superhero show, Adventures Of Superman was a surprise success". avclub.com. Retrieved October 29, 2013. ^ Grossman, Gary H. (1976). Superman: Serial to Cereal. Popular Library. p. 236. ^ "Superman on Earth." 1952. The Adventures of Superman: The Complete First Season, created by Robert Maxwell, performance by George Reeves, episode 1, Warner Home Video, 2006, disc 1. ^ Adventures of Superman. Episode 1: "Superman on Earth". Original air date: September 18, 1952. ^ "1951 Rambler Custom Landau". Howstuffworks.com. ^ "Lois Lane's 1950 Nash Rambler Custom". Articboy.com. ^ "TV Cars". Hemmings Classic Car, June 1, 2005, Jim Donnelly.